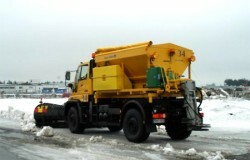 The Mercedes-Benz Unimog is a compact, professional and off-the-road implement carrier ideal for airport applications. In the model range U 300 / U 400 / U 500, this implement carrier has been specifically tailored for all-year-round multiple application demands. 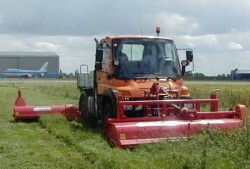 The Unimog’s fields of application vary from snow-clearing operations and sweeping operations on access roads and airplane parking lots, to maintenance jobs in green areas. It can tackle mechanical cleaning of traffic control facilities and functions as a compact aircraft hauling machine. 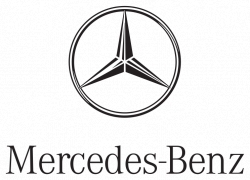 The Mercedes-Benz Unimog is a true multi-tasker for almost every imaginable airport task and plays an integral part in many airport maintenance fleets worldwide: from Amsterdam, Hamburg, Helsinki and Hanover through to London, Heathrow, Gatwick, Stansted, Edinburgh and Glasgow all the way to Aberdeen. Thanks to the narrow vehicle width, short frame overhang and short front-end dimension, the Unimog has an outstanding turning radius and large implement lateral overlap (ie. snow plough). The Unimog ensures a cool head and warm feet. The heating and cooling system with integrated air conditioning gives you complete control over the cab. The Unimog enables perfect all-round vision while working and driving. The driver has a prominent view of the front mounting plate, due to the short-bonneted concept. The front panorama windshield, rear window and low-cut door windows offer, in addition, an excellent view onto the working and traffic area. Permanent all-wheel-drive is the solution for high traction. When you need maximum traction for all conditions, then you can simply lock the longitudinal differential and both axle differentials, while in motion, at the touch of a button. The fully synchronized electropneumatic manual transmission (Telligent®) distinguishes itself with eight forward, six or eight reverse gears, its very quiet operation, long service life, high efficiency and wide range of operations. The EQR (Electronic Quick Reverse) makes it easier for you to change directions quickly – full speed in both directions. The working gears (8/8) expand the speed range according to your needs and increase the towing force. When using the crawling gears (8/8) you have maximum PTO speed even at low working speeds. In total you have up to 24 forward and 22 reverse gears. The Unimog is equipped with state-of-the-art driving and operational, integrated standardised implement drives and interfaces.